High winds may have led to a Fort Lauderdale-bound US Airways plane being evacuated Thursday after an aborted takeoff caused the front landing gear to collapse. The Airbus A320 screeched to a halt just before 6:30 p.m. after the botched takeoff at Philadelphia International Airport, officials said. Two of the 149 passengers suffered only minor injuries, none of the five crew members aboard were injured. Reports first suggested the airplane’s front tire had blown out, but the airline confirmed to CBS Philly the front landing gear collapsed. No official cause has been determined, but one passenger says wind may have been a factor. The plane actually made it into the air, according to an airline spokesperson, but ‘the captain elected to abort the takeoff for reasons unknown at this time,’ a spokesperson told the station. ‘The nose gear collapsed when the aircraft returned to the ground,’ the spokesperson continued. 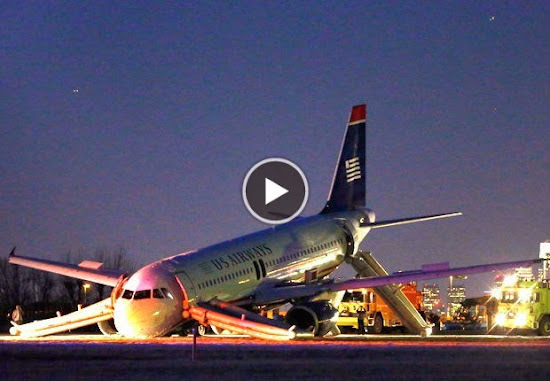 The collapsed nose gear caused the jet to skid down the runway and badly damage its front end. A high wind advisory was in effect for the area warning of wind gusts up to 60 mph at the time of the accident. 'The strongest winds will occur with and behind the cold front that will sweep through the region between 6 PM and 9 PM this evening, the National Weather Service advised. A peak wind gust of 48 mph was recorded earlier in the day, according to the NWS. Emergency personnel surrounded the downed plane as a safety precaution. Smoke could be seen coming from one of the plane's engines as people slid down emergency evacuation slides, but it is not clear if the fire started before or after the botched takeoff. Two people suffered serious injuries, KYW reported, but those may have occurred during the escape. A MailOnline attempt to reach the spokesperson for further information was unsuccessful. There were no serious injuries, and people seemed to take the incident rather well, even posting selfies to Twitter with the wrecked plane in the background. All ground traffic at the airport, the nation’s 18th-busiest, according to federal statistics, was halted for about one and a half hours. Three of the airport's four runways were back in service by just before 8:00 p.m.